Around the World — Contains a complete set of gorgeous papers perfect for a multitude of beautiful ethnic and traditional crafts, including African, Native American, Asian, Hispanic, Middle Eastern, and Down Under. The set includes 2 sheets each 48 designs, for a total of 96 sheets. Individual sheets measure 8½" × 11". Classroom Pack — Enhance any project with this colossal collection of 248 double-sided, colorful craft papers. Includes 40 sheets each of animal, fabric, and sea life papers, and 16 sheets each of skintone, African textile, Native American, Hispanic, autumn, spring, holiday, and Valentine papers. Sheets measure 8½" × 11" each. Tie-Dye — Includes 16 different tie-dye designs, printed on both sides, to offer more variety for any paper craft project. Each package contains 32 sheets of 8½" × 11" paper. Art Nouveau Era — Includes 32 sheets of double-sided 8½" × 11" paper featuring rich organic and curved motifs of the Art Nouveau era. Global Village — Includes 48 sheets in 12 beautiful designs from around the world, each representing a country's heritage. Each package contains 8 designs in an 8" × 8" format and 4 designs in a 4" × 8" format. Native American — Includes 8 colorful designs developed by tribes of North America’s first people: Navajo, Potawatomie, Coast Salish, Seminole, Kwakiutl, Blackfoot, Nez Perce, and Mi'kmaq (Micmac). Each package contains 32 sheets of 8½" × 11" paper. 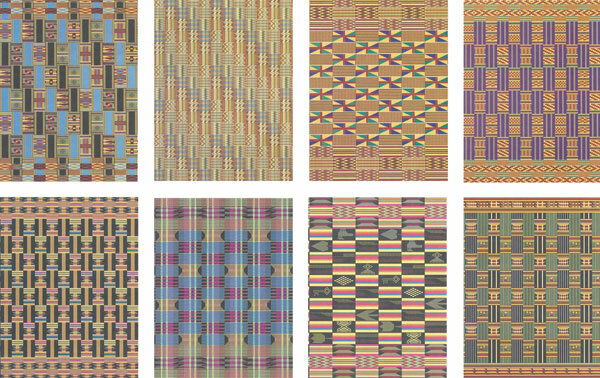 Down Under — Includes 8 original Aboriginal designs reproduced on 32 sheets of 8½" × 11" paper. Also includes 8 reproducible line drawings for coloring. Stained Glass — Includes 8 unique stained glass textures, printed on translucent paper. Each package contains 24 sheets of 5½" × 8½" paper. Animal — Includes 8 hand-painted animal designs, reproduced on 8½" × 11" paper. Each package contains 40 sheets. 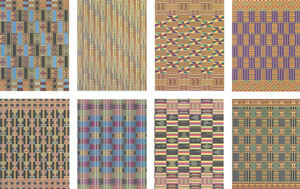 African Textile — Includes 8 patterns of kente, the colorful African strip-woven cloth native to Ghana and Togo. Each package contains 32 sheets of 8½" × 11" paper. Retro Pop — Let these authentic patterns take you back to the 1960s! Includes 16 designs, two per sheet, ideal for greeting cards, scrapbooks, collage, invitations and more. 32 sheets per package of 8½" × 11" paper. Antique — Use these double-sided parchment-style papers to help illustrate poems and short stories using medieval lettersets and scripts. Draw an antiqued family tree, family coat of arms, or a realistic treasure map. Package includes 32 sheets of 8½" × 11" paper.